We close out our January 2019 music schedule by featuring the infectious afro pop reggae of H_art The Band. Check out their profile below. African-pop, urban-colored vintage, uniquely comical just to name a few of the words used to describe this versatile blend of artists Mordecai Kimeu, Kenneth Muya and Wachira Gatama. The three met in the corridors of their acting careers, in late 2012, where Mordecai auditioned Kenchez and Wachira for a play on cancer-awareness at the Kenya National Theatre. During the rehearsal process the three discovered that they shared a similar passion for music, spoken word/poetry, comedy, dance, fashion and generally, life. They later performed together for the first time at a few months after this encounter at Dass Ethiopian Restaurant and, H_ART the BAND was formed. Not long after, they joined Penya Africas prestigious artist development program Sauti Academy from which they graduated from in April 2014. Imagine acoustics, smooth vocals with a touch of poetry, spoken word, freestyle rap, drama, dance and fashion all blended into one thick pastry of art. That is what H_ART the BAND is all about. 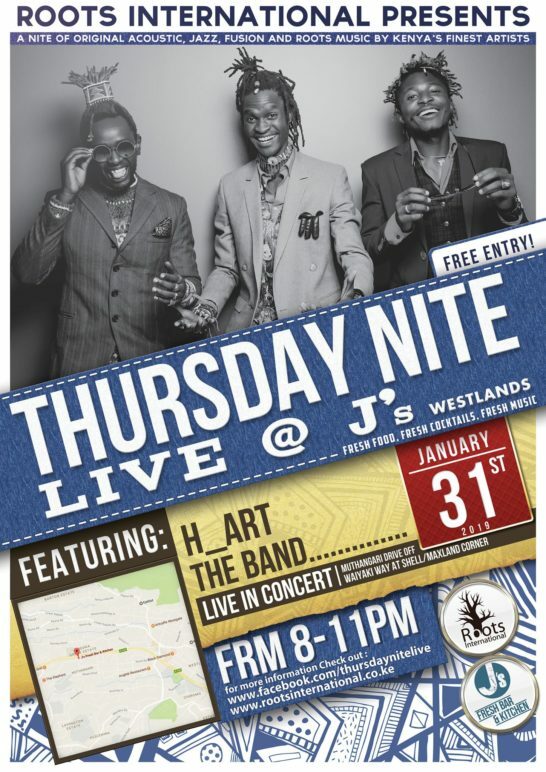 H_ART the BANDs music speaks to generations it being heavily inspired by day-to-day experiences, With Mordecai and Wachira both being Slam Africa poetry Kings, self-taught guitarist Kenchez compliments their rhymes with smooth, danceable tunes. Mordecai adorns their jams with his heavenly vocals and lyrics, while Wachira livens it up with his witty spoken word/poetry. By aligning their unwavering dedication to the do-it-yourself work ethic with a signature sound, this fusion thus, creates a fresh musical style they like to call the Afro-Poetry-Experience. Having performed at every venue and on every street corner in the past year, H_ART the BAND has built a steady reputation with various audiences. Their undeniable musical versatility, energy and witty nature makes every performance they do a fan-magnet, H_ART the BAND gives their fans a memorable experience coupled with a feel-good vibe. In 2015, With only two years in the Kenyan music industry,they had been listed among the top 5artists in terms of radio airplay by the Music Copyright Society of Kenya. They were nominated and won Various awards including but not limited to:the Bingwa Award for Stage performer of the year 2015, the Mdundo platinum award for having more than 100,000 online downloads, the Pulse Group Music Video of The Year among others. Their second single Nikikutazama landed them two nominations in the All Africa Music Awards(AFRIMA2015) Revelation of the African continent and Most promising artiste in Africa. Their singles so far released are; UlizaKiatu, Nikikutazama, Lovephobic, CoolDown, ForYou as well as a colaboration with Kenyan Afropop Power House Songstress DELA Adabu, clubbanger Mashesha featuring Soulful SingerBenSouL_ & “RoseLLa” featuring Tanzanian Legend Lady JayDee have been on heavy rotation in various stations evidence to there being no limit to the amount of greatness they harbor.